Shoegaze band Bethany Curve's first album in 15 years breathes deeply and dreams through the darkness. More bands should have their own mottos. Californian shoegazers Bethany Curve have long had one: "Atmosphere | Arrangement | Sound | Layering | Noise." This could easily be adopted as the motto for all shoegaze music. Younger fans of the genre -- and even some older ones -- likely first found out about Bethany Curve by way of Cherry Red Records' Still in a Dream: A Story of Shoegaze 1988 - 1995 compilation from 2016. The good news for newcomers then was that there was a good-sized back catalog to track down: their debut Mee-Eaux from 1995 (hard to find until reissued in 2017), Skies a Crossed Sky (1996), Gold (1998), You Brought Us Here (2001), and the Flaxen EP (2003). 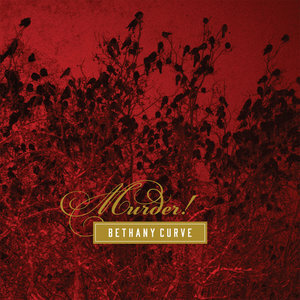 The even-better news now is that original members Richard Millang (guitars and vocals) and David Mac Wha (drums), along with guitarist Nathan Guevara and vocalist Lisa Dewey, have brought Bethany Curve back after 15 years on hiatus, and the result is Murder! (exclamation point theirs). The ten songs on Murder! illustrate why 'atmosphere' is the first directive in that motto. The guitars billow and expand upward and out, tethered by stark percussion and the gothic dreams of Millang's and Dewey's searching voices and words. The music is dense enough to get lost in, but gives enough room to watch the light and dark interact. Stream the album in full below. The album will be available 18 January on Kitchen Whore Records, and is available to order now.